The flood situation across the country worsened yesterday as heavy rain continued raising the water level in almost all the major rivers including the Jamuna and Padma. In the next couple of days, it is likely to take a more alarming turn in the districts adjacent to the rivers. Many fresh areas went under water forcing more and more people to leave their houses and herd themselves to a higher ground. Ferry service on Aricha-Nagarbari route remained snapped due to floods, after the flood waters washed away the pontoons at the Nagarbari end. Collapse of levees in some districts including Sirajganj and river erosion in Bogra have also contributed to inundation of new areas. Low-lying areas in Gaibandha, Bogra, Jamalpur, Sirajganj, Pabna and Tangail are likely to go under water by the next 24 to 72 hours. The Ganges-Padma too kept rising at all points and was flowing 30 cm and 11 cm above danger level. In the 24 hours ending at 6:00pm yesterday, the Met Office recorded 200 millimetres of rain in Sunamganj and 180mms at Lorergarh. Four villages at Bera upazila and low laying areas at Shujanagar upazila went under water. 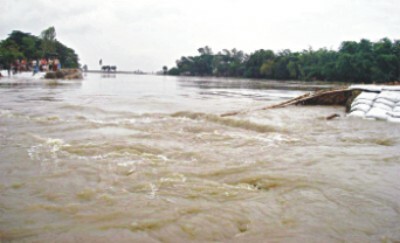 More than 20 villages in Belkuchi, Sirajganj sadar, Shahzadpur and Chowhaly upazila headquarters and Kazipur municipality have gone under water, forcing some 500 weaving factories and 40 educational institutions to be closed. About 1,000 ponds in Kalmakanda, Durgapur, Atpara, Madan, Mohonganj and Khaliajuri upazilas have been inundated and fish of an estimated price of Tk 10 crore has been carried away in flood waters.